Boston Celtics forward Jayson Tatum dribbles against Philadelphia 76ers center Joel Embiid during the first quarter in game three of the second round of the 2018 NBA Playoffs at Wells Fargo Center. When the Sixers made the move to trade up for the No. 1 overall pick last summer, their vision probably looked something like this: with the game on the line in a 2018 playoff game, they would have a perimeter player you could clear the floor for, and count on him to create a good look for your offense all by his lonesome. The problem, then, is that the guy who is doing that right now is Jayson Tatum, the player your division rival has standing across from you in a playoff series. That would be bad enough if the Celtics just so happened to stumble upon a gem with their top pick, but he will forever be connected to the Sixers because of the draft trade that guaranteed Markelle Fultz's arrival in Philadelphia. We're a long way away from knowing what Tatum and Fultz are going to be when they hit their respective peaks, but as this series has unfolded, it gets harder and harder to sweep under the rug that one draftee is thriving, while one collects dust on the bench. Philadelphia's biggest problem on offense — one that gets amplified in a playoff series, where physical basketball is king — is that they don't have anybody who can create their own shot from the perimeter. Passing magician though he may be, Ben Simmons has no credible shot to speak of, and the rest of the team's shooters are reliant on others to create the looks for them. This isn't much of an issue for Tatum, who the Celtics can ask to run the offense in late-game situations already. He left Duke with a reputation as one of the most polished offensive prospects in the class, but what we're seeing out of him at this early stage is fairly ridiculous. He abused lesser defenders like Marco Belinelli, and on a possession in overtime that ended with Joel Embiid switched onto him, he got the big man to bite on quick fake inside and finished a clean look at the rim. At just 20 years of age, Tatum led all scorers in a playoff game once again, and he didn't do it by trying to play hero ball and shoot over multiple defenders all game. His 24 points on 11/17 shooting came on plenty of isolation possessions, sure, but those are looks the Celtics want him to play out of. "Just call the play and get out of his way," Celtics coach Brad Stevens said after Game 3. "I don't know what else to say. He knows what to do and he has the mentality to do it. It doesn't mean it is always going to go in, it doesn't mean that he's always going to go 11-for-17. I can guarantee he isn't going to miss three free throws in a row very often, but the way I look at it is the law of averages means he will make a lot in a row." Once upon a time, it was reasonable to believe Fultz was the sort of guy who could do such a thing. Watching him carve defenses up at Washington, the public was given every indication that he was going to make life miserable for opposing defenses for years to come. The skill level he showed as the lead guard at the University of Washington was absurd, and that continued all the way up until Summer League last July. When's the last time you saw Fultz even consider taking a shot like that one? When's the last time any of us saw him running through three-point looks in a practice or pre-game setting? Is skill development on finishing at the basket or mid-range jumpers going to mean much if teams can just sag off him in perpetuity? When the Sixers were waltzing through the end of the season with Fultz playing backup minutes and running over the Heat in their first-round series, it was easy to keep the Fultz questions on the backburner. As your opponent's top draftee goes on a series-long barrage to effectively put an end to your season, it's a lot harder to pretend the elephant in the room doesn't exist. We are at a point now where Fultz is barely even being considered as an option for Philadelphia to turn to when it matters. When you compare Fultz and Tatum present day, there are few Sixers fans who want to grapple with this reality, citing one of several explanations before moving on: Fultz is young and hasn't had time to prove himself, you can't judge a long-term trade this soon, and none of what we have seen from Fultz this year was foreseeable. On some level, those points are fair and should be taken into consideration. However, they also necessitate a deeper look at a trade most people took for granted at the time it was made. What was glossed over by almost everyone at the moment the trade took place — including by this writer, naturally — were the drawbacks of giving up the No. 3 pick and what will likely amount to the Sacramento Kings pick next season. The basketball populace took for granted that Fultz was a sure thing and a great fit and assumed any cost was worth it. Had the Sixers actually gotten the Fultz we saw through last July, that indeed may have been the case. But even if the outcome for his rookie season was not foreseeable as the Sixers moved up to take him last June, more time should have been spent assessing the uncertainty of any individual outcome. This specific outcome, with Fultz changing his shot mechanics and ultimately being unable to reclaim them all these months later, may not have been foreseeable. But one in which he got injured and was never able to live up to his promise was not unrealistic, as it happens to top prospects all the time. One in which he never lived up the hype is reasonable, as prospects across the board are volatile and susceptible to wild swings in outcomes. One in which other players looked better with NBA spacing and coaching than they did in a college system remains likely, because it happens almost every year. Even if you want to quibble with the idea that it's a sure thing for Tatum to be better than Fultz over the long-term — it would take outlier results from here on out for that to change, frankly — there is the matter of the future pick owed that really tilts this trade in Boston's direction. Not only do they have the player who is currently better and not much older than the guy the Sixers selected, they have another valuable pick in a future draft with which to bolster their core. You can never have enough high-value picks, specifically because of the aforementioned volatility that comes with betting you know enough about a teenager to bet the future of your franchise on him. The reason all these future picks have come to be known as "assets" is that they're not just selections, they're currency to be spent in a variety of ways. If the Celtics want to try to make a move for another readymade star sometime soon, they now have an extra sweetener to throw in alongside their young collection of talent and an appealing situation for any incoming player looking to win. The question isn't whether the high-end outcome for Fultz is worth giving that up, but whether the average of all the outcomes is worth it. To date, we're seeing something close to the lowest-end outcome imaginable for Fultz, excluding those in which he was injured to a degree that he was never able to play in an NBA game. This goes from academic sounding to life-altering in basketball team building, though. Looking at a player with an estimated 10% or 20% chance of being a star over the next three or four years can’t be written to zero—that’s about as high as those odds ever get. That’s surely a very, very high number for any player that is ever available to you to be added to your team. Once you accept that, it becomes clear that shrinking the confidence interval around that estimate (and the estimates of the downside risk at the other end of the spectrum) becomes pretty darn important. In some decisions, the uncertainties are savage. You have to find a way to get comfortable with that range of outcomes. If you can’t, you’re forced to live with many fewer options to choose amongst which leads over the long term to lesser and lesser outcomes. This Sixers regime may agree with the principles laid out here generally, but believed they had a rare opportunity to find a potential star who fit perfectly with the players they had in place. So far, that hasn't worked out too well. Whether you're a Fultz optimist or a pessimist and regardless of what you believe about where Tatum's ceiling will end up, it's hard to deny how badly the Sixers have needed another offensive creator on the perimeter. And the trouble with Fultz's rookie campaign is that you have way less information than you'd want about your team heading into the most important Sixers offseason in recent memory. One of the reasons Fultz is here in the first place is because of a similar problem the Sixers encountered heading into last offseason. The Sixers obviously believed Simmons could be a primary ballhandler, but it's hard to know what that looks like in practice without seeing him play in an actual NBA game. So they headed into last summer placing primary initiator equity at the top of their needs chart, inspiring the trade up for Fultz. Even if Fultz has played 14 NBA games to the zero Simmons did in the previous season, I would argue there's even less certainty about what to expect from him moving forward than there was about Simmons last offseason. This is not just a case where you are waiting to see what a player looks like returning from injury, but whether they will ever figure out how to rediscover the skill that made him a coveted prospect to begin with. A contingent of the public focuses on health-related issues for Fultz as a way to explain away what has happened. But as I have reported repeatedly since the fall, there was never an extended period of time in which Fultz stopped shooting jumpers. He was shooting while out indefinitely, he was shooting in the winter months, and he is most likely still shooting behind closed doors today. If someone has been working on the issue that whole time without any material results to show for it and we're where we are today, confidence should dip in the ability to expect a return to form by the time next season starts. The Sixers almost have to take the pessimist's view on Fultz going into free agency this summer. They have a very small window of opportunity to supplement their core players before big-money extensions price them out of free agency upgrades. If the Sixers hold the line this summer expecting Fultz to come good and he doesn't, they have effectively capped the ceiling on their project in the years to come. This is true even when you consider the value of potential trade chips, too. Dario Saric will be up for an extension after next season, and his value will be scrutinized a lot more when a team is being asked to pay him eight figures a year. The Lakers pick will be gone after this June, and the idea of that player will soon just be a player, drafted by front office that only has one draft pick of their tenure producing present-day value. The Sixers do have two legitimate blue-chip prospects leading the way, and that should bring fans comfort in the event their free-agency plans go belly up. But how many young would-be dynasties have fallen apart before winning anything? Some of the teams they were compared to after the Heat series — the '86 Rockets, the 95 Magic, the 2012 Thunder — all fell or were torn apart before ever winning titles. Success is fickle, even for teams with gargantuan talents, and having a visible path to the mountaintop doesn't mean you're guaranteed to succeed at climbing it. Life is going to get much harder for the Sixers from here, and expectations will only grow. After winning 50+ games, they are going to be a game other teams circle on their calendars, instead of a fun upstart. Those backbreaking losses from this season after conceding big leads are not going to be excused away next year. Everything they do and every player on the roster will be met with a level of scrutiny they've not seen to date. And so the pressure continues to mount on Fultz to deliver on the value the front office placed on him, and Dr. J won't be the only person this summer who noticed Tatum tearing the Sixers to shreds in the franchise's biggest playoff series since the Allen Iverson era. No one is going to be interested in hearing about scapular dyskinesis in October. 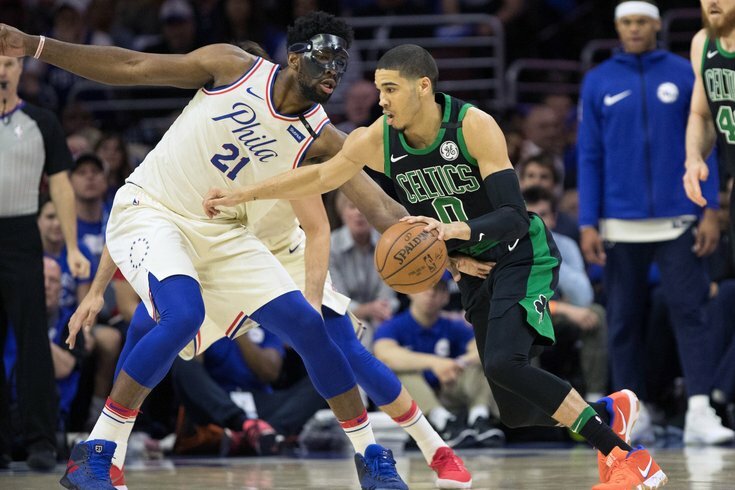 This move was always going to define Bryan Colangelo's tenure in Philadelphia one way or another, and it is certainly defining Philadelphia's second-round series with the Celtics. As a Celtics wing equals scoring feats of a rookie Larry Bird, the Sixers' top draftee posts motivational memes on Instagram and watches a series he has done nothing to impact.